If I played a clip, I’m pretty sure that you would recognize his distinctive bass-baritone voice. Most of us know him as the lovable Herman Munster from The Munsters or even his later role as the endearing and knowledgeable neighbor in Pet Sematary. When I posted where I was going, my brother immediately dropped lines from My Cousin Vinny. Fred Gwynne was an American actor who passed just shy of his 67th birthday in 1993. 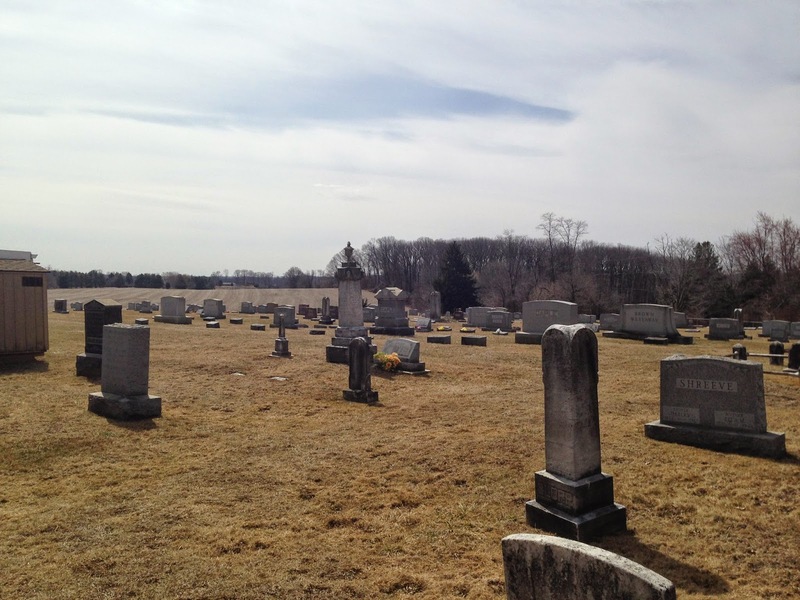 When I learned that Gwynne was buried in an unmarked grave in Finksburg, Maryland, I figured that I would be taking a journey to his graveside this summer alone. It’s probably important to note right here that I don’t get googlie-eyed over celebrity. In fact when I hear the term “Hollywood Actor”, I usually tune out. So, I’m not necessarily making it a goal to visit actors’ resting places. But there are a few actors who mean something to me; and, Mr. Gwynne is certainly one of them. Gwynne is buried at Sandy Mount United Methodist Church cemetery which is behind the church. 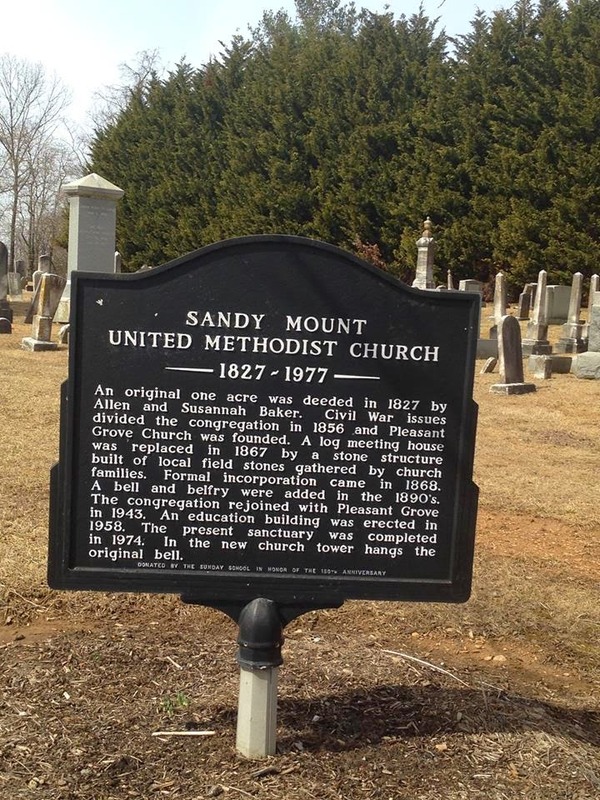 Sandy Mount church has a long history and I was fortunate enough to find the paperwork for the historic listing and even the nomination for location to be added to the National Historic Places listing. There is a deed from September 28, 1827 that shows that the land was conveyed from Allen Baker to five trustees under the condition that they must erect a house of worship. In 1855 there was a controversy about whether or not to allow enslaved Africans to worship with their “masters”. The church remained divided and part of the congregation moved to another location and began Pleasant Grove Methodist Episcopal Church… that is, until 1943 when they were again reunited. In 1867, three stone masons by the names of Ward, Bush and Shipley who had built the Pleasant Grove church, built Sandy Grove’s stone sanctuary which currently isn’t being used by the church except for special occasions. There is even a legend that because the three men had gone out drinking the front walls appear slightly irregular. It would be fascinating to find more information about the cemetery itself but what I have discovered has been quite limited. Although it isn’t very big, there are some old gravestones. When I was doing research for the journey, I didn’t expect that most people would want to visit a grave without even a marker. Of course, my friends are not *most people* so it turns out that once Jade and I went, a few friends were very excited about the adventure (and perhaps a bit disappointed they didn’t get to come along). 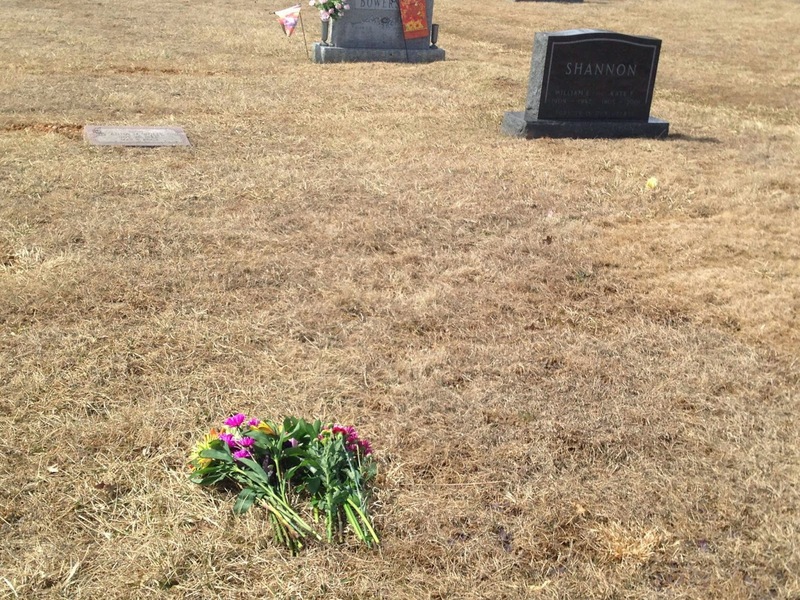 Why Gwynne’s remains rest in an unmarked grave isn’t quite clear. As far as I can tell, at the end of his life Gwynne wanted to be Fred Gwynne the man and not Fred Gwynne the actor. In an article in Harvard’s The Crimson (2001), it reports that his daughter Madyn Gwynne reveals, "He was a far more complex character than the one he played on The Munsters." Of course he was! Gwynne studied portrait-painting before enlisting in the Navy in World War II. He served as a radio operator in a submarine-chasing vessel. After serving, he attended the New York Phoenix School of Design, and Harvard University. I was excited to learn that Gwynne was also a children’s author including It's Easy to See Why, A Chocolate Moose for Dinner, The King Who Rained, Best In Show, Pondlarker, The Battle of the Frogs and Mice, and A Little Pigeon Toad. While he may have tried to distance himself from roles that rhymed his Herman Munster character, during a 1982 interview, a reporter asked about his favourite roles. Gwynne noted plays and then he paused... "and I might as well tell you the truth, I love old Herman Munster. Much as I try not to, I can't stop liking that fellow." Soon before Gwynne passed, he and his wife bought land in Taneytown, Maryland which is Northeast of Baltimore. During that time, he only worked as a voice-over artist in commercials. Within a year, he was diagnosed with pancreatic cancer. When he passed away from complications associated with pancreatic cancer, he was buried in Sandy Mount Cemetery in Finksburg, MD. His funeral was private and he was buried in an unmarked grave. When Jade from Daughter of the Jaded Era and I were planning our Blogger Meet Up Adventures Part 2, I knew that I didn’t want her to have to run through a snowy DC again. She also had only seen a small part of the U.S. so I suggested taking the journey together. 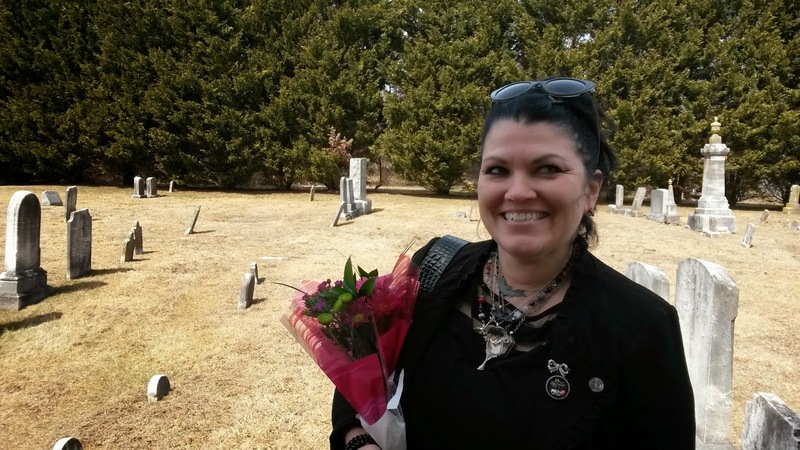 We headed out on Thursday which was a pretty beautiful day to be in a cemetery. GPS made it fairly simple to find the cemetery. We picked up flowers at a grocery since we couldn’t find a local florist and located Gwynne's location. There were numerous old graves that could use a bit of restoration in the cemetery on the side of the church. The cemetery includes obelisks and other traditional turn-of-the-century markers. 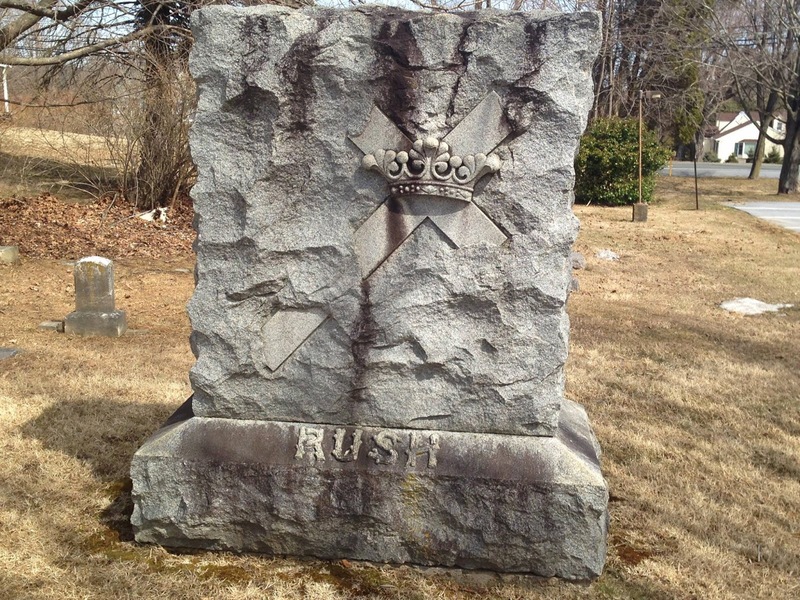 The Rush stone was near the parking lot. I thought it was a stunning example of craftsmanship. Gwynne's plot is located in the back of the cemetery in a section that appears much more modern. Most of the cemeteries that I visit are quite wooded. At Sandy Mount, one can stand near Gwynne's resting place and see for what seems like miles. In the distance there is even a windmill. Not a bad place to spend forever if you ask me. Of course, neither of us ever knew Fred-Gwynne-the-man so we can only discuss the characters he played… and naturally, the character of Herman Munster sticks with us. I think it’s easy to start comparing The Addams Family and The Munsters. Both series aired from 1964-1966. When Jade and I were standing graveside, she even mentioned this. At the time she stated and then later noted in her post that the family of The Munsters was a bit dysfunctional. At the time I wasn’t quite sure why I felt the urge to defend these characters. This week has been filled with so much activity that I’m finding myself slowly processing; trying to grasp each reflection has been like grabbing a cloud. I’ve always been much more connected to The Munsters than The Addams Family. This could be because The Munsters were aired as reruns right after school so I grew up watching these old episodes. I think what connected me to the Munster family was their working-class roots. The Addams always appeared to be independently wealthy while Herman Munster with his enormous lunch box had to go off to work at the funeral home. He even started out as the “nail boy” working his way up through the business. And, viewers learn that he used to be in the army and fought in WWII. In many ways, the characters come across as a typical American family and Mr. Munster is (at least stereotypically) the all-American Dad who is a bit childlike but who always means well. So many of the episodes followed the formula of *fitting in* and blending…immigrants coming to America and living the American dream in an old house that they thought was just right (albeit dusty and dilapidated just like our own homes). 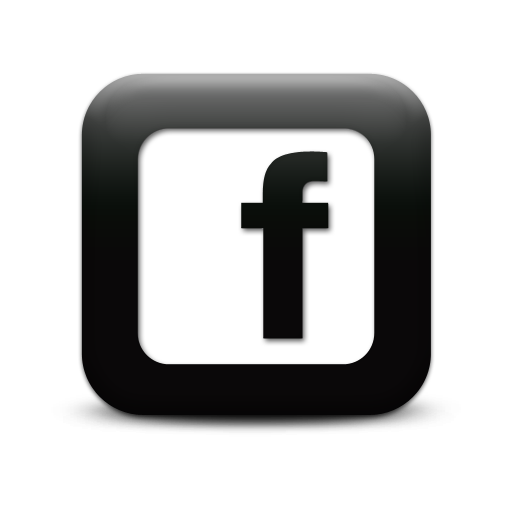 I guess I connect because The Munsters story is my story in many ways. My family immigrated and they always thought they blended in even when their Polish roots stuck out… but just like the Munster family, they didn’t mind. They loved being themselves and they loved being here. So while Mr. Gwynne and his family wish to keep his resting place quiet, visiting a grave is a way to pay our respects, to say “Thank You!”, and to connect to someone who made a difference in our lives. This was only the first stop in our adventures of the day and I will write more about our other adventures that afternoon and the next day in later posts. Jade has already mentioned the "spirited" self-guided Ghost Tour that we took so you'll want to visit her post to read about that. I really wish we had videotaped ourselves giving the tour... but I'll write more about that later. to volunteer and reconnect with Connie. Today I'm still scratched, achy, and bruised... but let me just say that being in a group with THE Woman In Charge was super awesome! And, dare I write that we worked on some of the best roses in Hollywood?!? 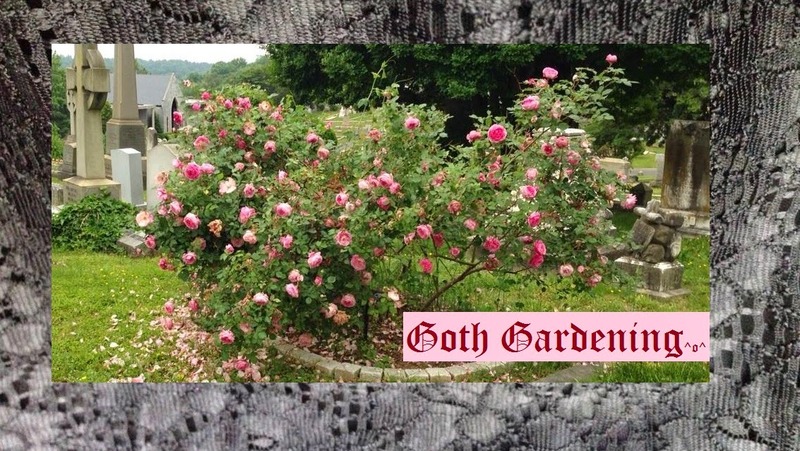 One was the famous Crenshaw Rosa Moschata (Musk Rose) which is a historically significant rose that I wrote about in my guest blog post for The Cemetery Researcher. More tales soon! I had an amazing time with you too! I'm sad that it had to end. What a strange cementary to European eyes, ours are usually much more cramped and with lots of trees... And thanks for the facts about a great actor, I didn't know that Mr. Gwynne was such an interesting man! This one in particular is surrounded by farm land. It looks a little odd for me too although our cemeteries certainly aren't as crowded. 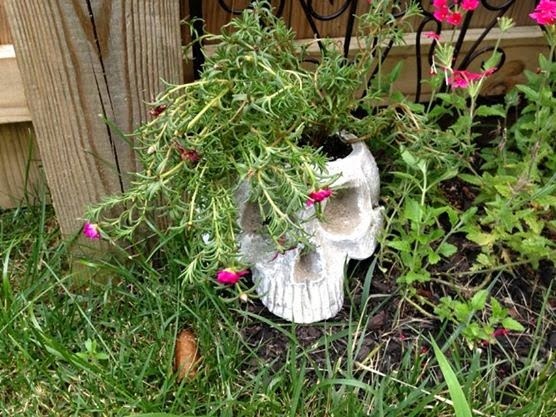 Such an interesting post, and looks like a wonderful (in a peculiarly gothic way) trip. I do remember him from Pet Cemetery, one of the first horror films I ever legally saw at the pictures. He had that wonderful lugubrious voice. I have to confess that I was subconsciously aware of both The Munsters and the Addams Family when growing up, but as a Brit they never really gelled with my cultural awareness. Sadly by the point I'd probably have appreciated watching them they were off our screens here. Hope they re-run them some day soon. Thanks Lucretia. It was an honor for me. It was so nice to be able to go with Jade who took the adventure as seriously as I did. What an amazing article! And I am so jealous, I so want to go graveyard visiting with you two! Great article! Thanks! I'm gonna look for his books. My friends and I have been wanting to plan a trip, to find Mr.Gwynee's grave site. Your story is quite helpful, thank you. Glad to see there are other fans out there of his work. Great story. Thanks very much! I happened upon your story while googling Fred Gwynne,but I was watching Car 54 Where Are You?I read both your and Jade's blog,using her link to get here.I was curious as to why he wanted an unmarked grave,and nobody knows that answer but him.I found that neither of your blogs mentioned Car 54,which was done by the same folks (well,created by Nat Hiken)and starred Gwynne and later in the series run,Al (Grandpa) Lewis. I don't have much to add other than I love the old Car 54 series it's old New York actors,scenes and probably the first series with an actor of color(I think that's the way we say it now)with a reoccurring role Nipsy Russell.It didn't last long,2 seasons,but neither did the Munsters.but had its fans in its day.My father used to Imamate the opening high pitched voice saying"Car 54 Where Are You? "so every time I hear the opening or closing credits,I think of him.I was a Munsters fan,but over the years Car 54 has been forgotten by most writers when referring to Gwynne,only the Munsters gets mentioned.Thats all I've got,other than Car 54 is running on Hulu,as I write this.Great blog,see you later. 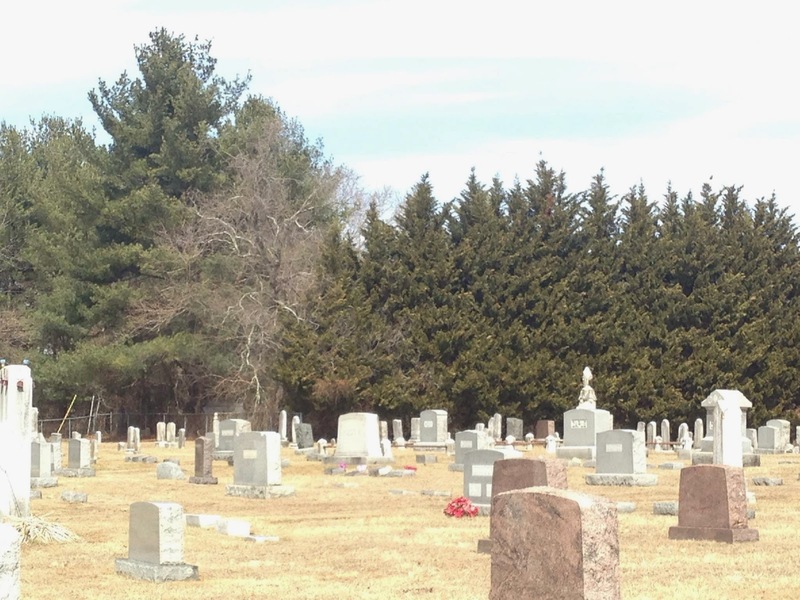 Like the many people who have already commented above, I am very happy to find your blog post about Fred Gwynne and visiting his unmarked grave. I did not know he illustrated children's books — and now will see if I can order a few from my local library network. I also feel, after reading your analysis of The Munsters TV show (and your insights regarding class and immigration) that I need to re-watch a few of those episodes with fresh eyes. And I have never watched Car 54 — so I will check out a few episodes of that, too. I did have the privilege and pleasure of working with Mr. Gwynne when I was a child actor, and what I remember most about him was his generosity of spirit. Looking into his compassionate face evoked all sorts of authentic emotions in me that might not otherwise have surfaced. If you are curious to learn more about the made-for-TV movie called Bound For Freedom we both filmed in the 1975, you can visit my blog (http://amusicalifeonplanetearth.wordpress.com). 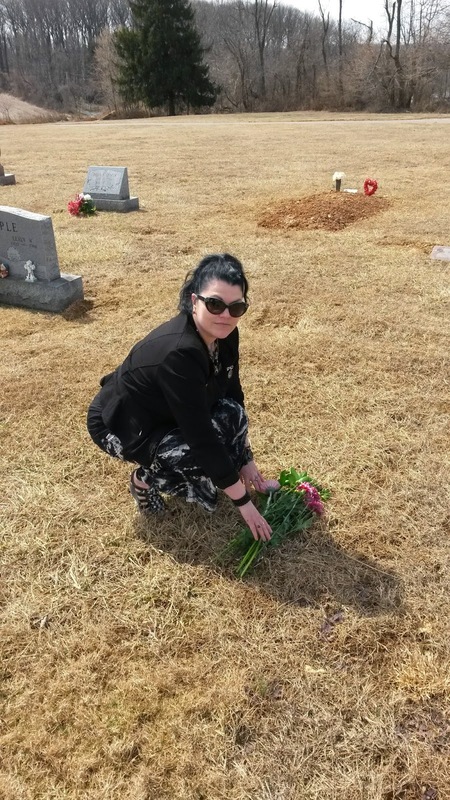 THANK YOU for taking the time to visit his grave and for writing this great blog post. Mr. McMillan, thank you for dropping by and commenting. And, thank you for confirming what I've always believed from afar- the generosity of his spirit. I'll certainly check out the link. Thank you! It bothers me greatly that Mr. Gwynne's grave is not marked even by a simple brass plaque. It's not like Finksburg, Maryland is going to be overrun by crazed fans vandalizing it. Some day someone, probably a descendant, is going to wish they could spend time at that grave, and it might well be that nobody will be able to find it. My father is buried in a cemetery that only allows flat brass plaques and even that bothers me, thinking how easy it would be for the plaques to become overgrown and disappear. It took me 18 years to be able to afford a proper headstone for my mother's grave (in a different cemetery), but it was extremely important to me to get that done. It's going to continue bothering me that Mr. Gwynne's family has not done something about this. I agree with you Monica. I find it hard to believe that even Fred would have agreed to this. I think an unmarked grave depicts shame, disrespect and disregard for the individual's life and the people who cherished it. It is dismissive to the enormous positive impact this man had on our culture, our world and my generation. I found a post in another website that claims this patch of ground described as Mr. Gwynne's buried site is "off by a country mile." Wherever he is, may he know that he was loved by so many. Taneytown is northwest of Baltimore. This was a great read. One of my favorite TV shows. I loved "The Munsters."